Credit: Tom Hogan/ Hogan Photos/ Golden Boy Promotions. 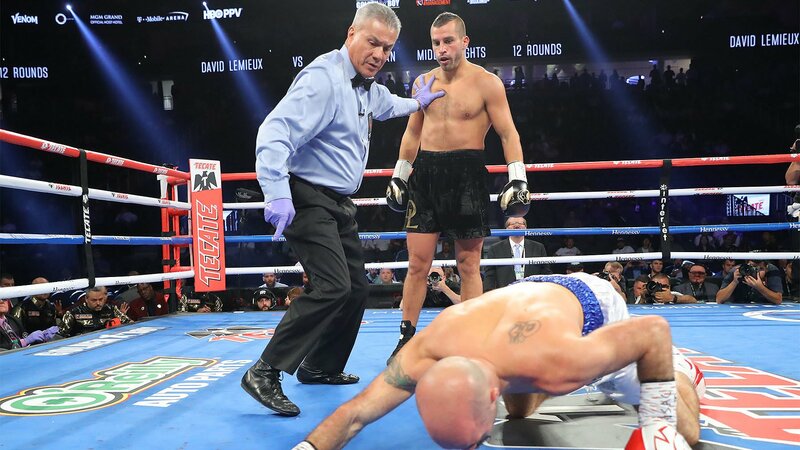 It was assumed that David Lemieux would be the return opponent for Canelo Alvarez this December at Madison Square Garden. Now, with Rocky Fielding defending his WBA super middleweight title against Alvarez, Lemieux is looking to get on the December 15th card in New York City and position himself for a 2019 showdown with Alvarez. Lemieux’s co-promoter Camille Estephan spoke with Boxing Scene, and said they’re not interested in putting their fighter on the shelf waiting for Canelo. “We want to keep David busy, keep him fighting and become unavoidable for Canelo,” Estephan said this week. When asked if they’d take a spot on the undercard, Estephan stated it would depend upon the situation. “I guess it’s a combination of two things,” Estephan said on Alvarez “passing over” Lemieux, “you have a world title that became available to him so that could become historical to say he became a world champion in three divisions. But I think David Lemieux is a very, very dangerous undertaking for any fighter. When David is healthy and at his best he’s going to drop anybody and we want that fight.